acceso a información de todo tipo se refiere. porcionan información sobre cualquier cosa. con casi cualquier persona u organizaciones de todo el mundo. una PC y de cómo utilizar ese monstruo llamado “Internet”. Tenemos, si ,que ser muy cuidadosos con los sitios elegidos para consultar sobre cualquier tema que sea. Cuidado entonces, sobre determinados temas, Ovnis por ej., es posible que predominen estas últimas. Pero, en realidad ¿tenemos acceso a todo lo que se conoce? Me da la sensación de que existe alguna información que no es dada a conocer, hasta que “alguien” lo determine así. En algunos casos quizas se trate de organizaciones o gobiernos. De hecho, en Uruguay, la organización oficial dedicada a la investigación del Fenómeno Ovni, dice tener alrededor de 40 casos que no ha podido explicar, sin embargo éstos no son dados al publico, ni siquiera a personas especializadas en el tema que han solicitado tener acceso a los mismos. Si en Uruguay sucede esto, suponemos que lo mismo debe pasar en otros lugares sobre distintos temas..
No estoy aquí refiriendome a cosas muy pequeñas, como la mencionada anteriormente. ¿Cientificos?, ¿gobernantes?...No lo sé, quizás sea una especie de grupo muy selecto de ambos. A veces nos vemos sorprendidos por cosas que se divulgan y que todo nos indica que tendrían que haberse conocido tiempo atrás. Me pregunto, por ej.,¿qué pasa con la supuesta existencia de vida en Marte.? ¿Existe actualmente o existio en el pasado? Es muy posible que la respuesta a estas interrogantes ya esté, pero se habría determinado que no es el momento oportuno para divulgarla. Esta idea que planteo, puede parecer algo "fantástica" ya que evidenciaría una especie de confabulación. 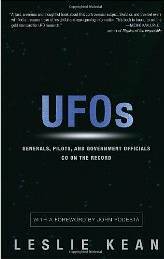 Si algo nos ha enseñado la Historia es que confabulaciones han existido en todas las épocas..
About “UFOs – Generals, Pilots, and Government Officials go on the Record” by Leslie Kean, Harmony Books, N.Y. 2010, 335 pages. Leslie Kean has made indeed a great effort to gather what she thinks is “good stuff” to make her case in favor of UFOs, their strange identity and the need to be officially investigated. That is –summing up— the content of her book and the goal she pursues. Now, I will comment on the book not as a journalist –which I am as well as Ms.Kean— but as a veteran Ufologist, with 52 years of personal involvement in the investigation of hundreds of “UFO reports”, three books written on the subject, and the contact and acquaintance with the best and most serious investigators throughout the world. I concur with Dr. Michio Kaku that it is “a seriuos and thoughtful book about this controversial subject”. And I would like to emphasize the words “controversial subject”. Precisely because of that, Ms. Kean, the journalist, doesn’t have the experience, expertise and knowledge behind the scenes that a UFO investigator has, her approach is just that of a journalist, trying to present the facts as she has received them from third parties, all of them official sources in their respective countries. The first thing to be considered is the fact that official sources are not a guarantee of objectivity, or of lack of interest in keeping the mystery around the “controversial subject”. Enough to think that the people working officially on the subject get their incomes from that. I will point out now to some of the things Ms. Kean didn’t consider when she was writing her book. For instance: she uses the Brazilian picture of Trindade Island, as an example of a photographed UFO. But, she did not investigate and go deep into the case to take into account for instance, an official document sent by the U.S. Naval Attache that discredits Almiro Barauna as a reliable photographer. She didn’t know that the pictures were not revealed on board of the “Almirante Saldanha” ship but later in the studio of the photographer. And –last but not least—she didn’t know that in the serious circles of ufologists, that set of pictures have been discredited as the picture of an airplane that was afterward retouched in a photo laboratory. She uses the Paul Trent pictures taken in McMinville and the first statement made by Dr. William K. Hartmann in the so-called “Condon Report”, but she didn’t know or skipped the fact that the same Dr. Hartmann “reversed his earlier favorable appraisal of the McMinville photos and has publicly stated his opinion that the photos are a hoax” (see “UFO Sightings – The Evidence” by Robert Sheaffer, 1998, Prometeus Books, N.Y., 327 pages). She presents the copyrighted report about the Belgium triangles, seen during 1989-1990 by Major General Wilfried DeBrouwer, but she didn’t know the criticism about the handling of the investigation made by a very serious Belgium ufologist, Mr. Wim van Utrecht. [a UAPSG member]. I would like to recommend to Ms. Kean that she read the book “UFO Revelation – The secret technology exposed?” by Tim Matthews. (A Blandford Book, UK, 1999, 256 pages). Chapter 9 has the title “Belgium Revisited”. And also Chapter 10, referred to the “Hudson Valley”. The events at Rendlesham Forest, in the UK has also been the subject of different analysis than the one presented by Mr. Nick Pope –a bureaucrat in the British MoD. Quite frankly, just reading what it is said that happened in such an important complex of air bases shared by the United Kingdom and the USA is almost ridiculous. 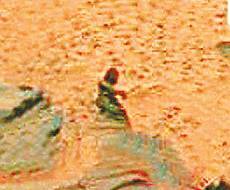 No one can imagine that if something really strange had landed in such a place, that a group of thee of four people would have been sent to see what was going on. Did Ms. Kean read about a military exercise performed there at that time? Apparently not. She takes the word of Mr. Pope for granted and that is all. I would like to recommend Ms. Kean, to read the Chapter six of the book “REVELATIONS – Alien contact and human deception” by Dr. Jacques Vallée, Ballantine Books, New York, 1991, 310 pages. She also cites the statements made by Jean-Jacques Velasco, who was the head of the French GEIPAN. Which is the main case that GEIPAN has to show? The supposed landing at Trans-en-Provence. The problem is that when you read carefully the details of such a case, the first thing you find is that it is almost impossible that the presumed “craft” could have landed where the witness said. There are other details about the case that make it dubious, at least. Now, Ms. Kean mentions in her book Dr. Peter Sturrock. This prominent scientist convened a very selective panel of individuals to deal with the “Physical Evidence Related to UFO Reports”. The group met in San Francisco, California, from November 28 to 30, 1997. After the “evidence” was presented, it was evaluated by a very selective international group of prestigious scientists. Among the cases presented to the group was the “landing” in Trans-en-Provence. “The panel concluded that a bigger analysis of the evidence presented in the working group is improbable that elucidates the cause or causes of the reports. Nevertheless, the panel considers that new data, scientifically acquired and analyzed could provide useful information. In this case physical scientists would have an opportunity to contribute to the resolution of the UFO problem.” (page 4 of the report). What this clearly means for me is that not even the Trans-en-Provence case was enough to be considered as an irrefutable proof of the existence of something totally unexplained until “new data scientifically acquired and analyzed could provide useful information”. It is relevant that the panel pointed out in its report about “the dangers to totally trust in the testimony of the witnesses” (page 3). Finally, pursuant to the goal to overcome the general rejection to the subject by the majority of scientists and the acceptance of a reality that deserves to be investigated and studied –to which I agree a hundred percent— Ms. Kean reveals an intrinsic contradiction in her presentation of the case. “The most credible sources clearly recognized, and stated repeatedly, that we don’t yet know what the objects are –contrary to the public assumptions that UFOs, by definition, are extraterrestrial spaceships”. And once again, I totally agree with this position. Nonetheless, throughout the book, the emphasis and sympathy of the author with the Extra-Terrestrial Hypothesis (ETH) is enormous. And I find that it not only conspires but also –from my sincere viewpoint— undermines the purpose of the book, and the goal to obtain scientific acceptance and the possibility to start a new official investigation in the United States of America. Curiously, the author did not interview or ask or invite the renowned Dr. Jacques Fabrice Vallée to write a chapter. Dr. Vallée is the most relevant and important thinker on the phenomenon. Dr. Vallée has argued very validly against the ETH as something acceptable, after all his experience together with Dr. J. Allen Hynek in the evaluation of the whole subject, and his access to very important sources of investigation. Moreover, the same Dr. Joseph Allen Hynek rejected the ETH and, instead, he preferred to think in terms of a parallel universe or universes. Therefore, the push that Ms. Kean gives to the ETH is at least totally counterproductive. I can assure you that the serious private investigators throughout the world have abandoned long ago the ETH. I think that the issue should be in the hands of scientists and not bureaucrats or the military. It is impossible to ignore the contents of the famous “Pentacle” memorandum and the revealing proposal that authorities in the United States create some “UFO cases” to study the public reaction. (“Forbidden Science” by Dr. Jacques Vallée, North Atlantic Books, 1993, 480 pages) Chapters 14 and 15. The same happened in France with another famous case, the one of Purple Justice (an area of Pontoise) where the main protagonist was Frank Fontaine. (REVELATIONS, Chapter 5). The Obama Administration has Dr. John Holdren as the Director of the White House Office of Science and Technology Policy. It would be proper for Dr. Holdren to take the decision to go on with this subject and put it in the hands of the National Academy of Sciences, or to decide the formation of a special and very selective group of scientists to deal with it, within a clear time frame for their work, and to go public with the results when the work is done. Otherwise, I prefer to trust a private group, well financed, in order to get “data scientifically acquired and analyzed”. To that purpose, I am glad to mention the extraordinary proposal made by a fine and devoted Italian astrophysicist, Dr. Massimo Teodorani, who has personal experience investigating the Hessdalen Lights. His paper entitled “Physics from UFO Data” (http://www.itacomm.net/ph/phdata_e.pdf) is a superb example of what scientists could and should do to deal properly with the subject. Ms. Kean should have been aware of it before writing her book. Finally, I concur with Leslie Kean when she transcribes the definition of a true skeptic given by astrophysicist Bernard Haisch, on page13 of her book, and the “perspective of an agnostic” to consider the whole subject. Regretfully, she herself fails to keep that perspective. Anyhow, I am sure that there is a great number of readers that will be delighted to know some UFO reports from the mouth of generals, pilots, and people who has been in the official side of the investigation. Some questions remain at the end. Why those generals and people in power have not done much more in order to push the subject at the highest levels of their own countries and to the United Nations? Why all of them agree and affirm that the UFOs are not a menace to the security of their respective countries? Have they considered how UFOs –provided they were the products of an exogenous intelligence— could be polluting our atmosphere, or spreading new seeds of diseases provoking pandemics, or meteorological and geological calamities? Absolutely not, because their focus has been strictly military. That is why military people should be out of the investigation. They could eventually be good reporters, and provide the necessary information for the study of a case (i.e. air traffic, special operations, experiments, etc.) but no more. Besides, when you read some cases where pilots have been witnesses, and you take into account the description of the UFO behavior, how is it possible that no one thought about the use of holographic images? The quick appearance and disappearance –vanishing in the air—, the vertiginous speeds, and the silence of something apparently material and structured, shouldn’t have opened their minds to that possibility instead of thinking that "this is not of this Earth”, or “this is beyond our technology”? I personally doubt when people involved in the so-called “official investigation” proclaim the ETH as the most plausible explanation. I have the same doubts that the general public has about an “official cover-up”, but as the reverse of it. All in all, I enthusiastically recommend the reading of this book. To the general pubic, it is a good introduction to the subject from a different angle. To the investigators and scholars specialized in this subject like me, it is an obligation to be acquainted with the last efforts done to convince the authorities that there is a need for a new agency to specifically investigate these Unusual Aerial Phenomena. If the agency is created, I am ready to cooperate.